Looking at the clouds at tonight’s Samsung Diamond League 100 meter race (I still call it the Roma Golden Gala), I thought it was going to downpour. But the rain and lightning started around 6pm and luckily, the winds pushed it about 40km north of Stadio Olympico. With a near full house, the showcase event was the men’s 100 meters with Usain Bolt, Asafa Powell, and Christophe Lemaitre. As expected, they finished 1-2-3 but you would never had guess as Bolt had a horrible start and Powell was leading at 90 meters. Yes, it was that close. But the biggest and loudest roar of the night was actually the Men’s 200 meters (a non Diamond League event) with USA-born Italian Long Jumper Andrew Howe winning the race in an impressive 20.31, beating seasoned 200m specialists. The 4x100m relay was also a close race between Canada and Italy to close of the evening. I will post those videos later if they weren’t shown on TV. What’d you think of bolt’s race? 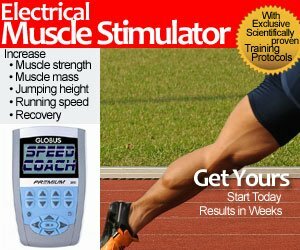 any reason to worry that his increased bulk is affecting his acceleration/coordination? i’m thinking he probably just had to shake off the rust, but curious for other thoughts. I thought walter dix won the 200m?? I saw the 100m on TV and usain looked very rusty in drive phase and start, but he hasn’t raced for about a year, so i would be too, especially in front of those crowds. 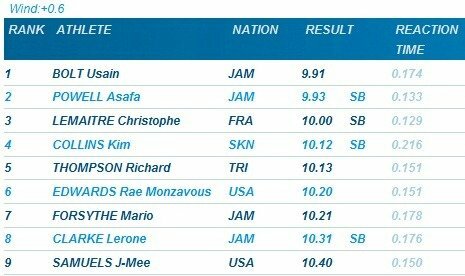 Usain was about 2 metres down on asafa after 50m. If he soughts the drive phase out he will reach a higher top speed aswell. 9.5x could happen this year if things go right, and of course the weather might not have helped. Also did you see lemaitre stay with bolt all the way 1m behind him – Legend. If he works on his ankle and knee stifness at ground contact, he’ll be a true competitor. 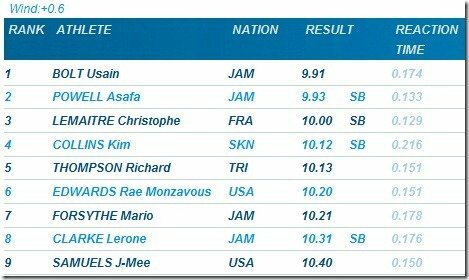 On Asafa Powell – he has a strange looking running action at top speed. Almost as if he’s trying to get off the ground too quickly and therefore not allowing himself to produce the ground force required to run at super human speeds, as Bolt does. @Paul, Dix won in Doha. @Paul, I agree that Lemaitre deserves a lot of credit for his run. For Bolt, he looks like he’s “stepping over” and running over hot coals, hence the very short contact time. I’ve seen him do that when he eases up (i.e. when he wins when Bolt is not around).